FIFA World Cup Russia: Ruptly 4K broadcast services. 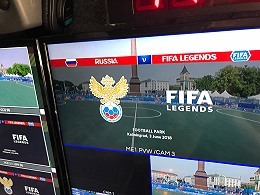 Berlin, Germany, June 2018: Ruptly provided original multi-camera live transmission of the pre-World Cup match with FIFA and Russian football legends in five different languages. The friendly game took place in Kaliningrad on June 3 and featured Brazil’s double World Cup winning captain Cafu, as well as Nwankwo Kanu, Nuno Gomes, Wes Brown, Niko Kranjcar and Pascal Zuberbuehler. The team was up against Ruslan Nigmatulin, Dmitry Sennikov, Andrey Fedkov, Dmitry Khlestov, Andrey Tikhonov and Aleksandr Panov. Ruptly's extensive coverage includes all World Cup events, pre-match trainings, exclusive interviews, fan zones, and viral videos from every host city in Russia. Using “Ruptly Stringer”, a UGC app, the agency is able to source and provide the best user-generated videos in real time.